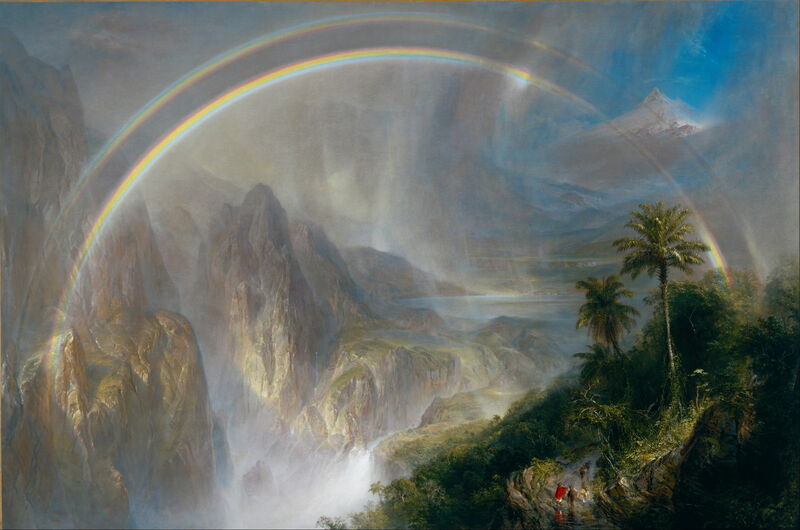 Frederic Edwin Church (1826–1900), Rainy Season in the Tropics (1866), oil on canvas, 142.9 x 214 cm, Fine Arts Museums of San Francisco, San Francisco, CA. Wikimedia Commons. On 29 April 1859, the first of more than twelve thousand people walked into the Studio Building on West 10th Street in New York City, to stand in awe and amazement in front of Frederic Edwin Church’s huge painting, The Heart of the Andes (1859). 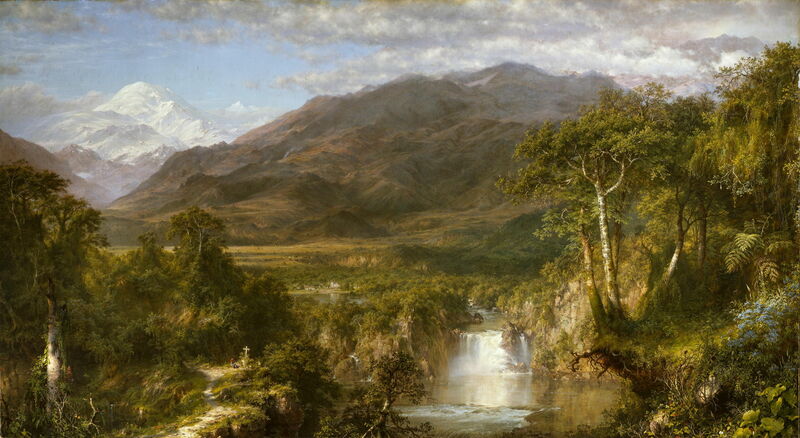 For many, its dramatic view of a densely-vegetated plain with its backdrop of snow-capped mountains was not its most impressive feature: it was the painting’s meticulous, almost overwhelming detail. Tucked away among the brightly-coloured birds and rich plant life, at the very heart of The Heart of the Andes, is a cross, with two figures by it. Dressed as locals, one sits, facing the cross, while the other stands just behind the seated figure, looking in the same direction. The cross is made simply of wood, and appears to have been decorated with a floral garland. It is partly obscured by the luxuriant wayside plants. Over its five square metres of canvas, these are the only visible humans. What is their meaning and purpose? They are part of a complex passage. The cross stands just off a path, which winds its way past a dead tree-trunk, seen at the left here, on which the artist has ‘carved’ the year and his name. The path then curves to the left, along the bottom of a small gully, where it disappears into the trees and undergrowth. On the other side of the river, to the right, is a small mission-like settlement. Facing the viewer is the tower and broad frontage of a church, with its large double wooden doors. Beyond and around is the enormity of nature: open plain with scattered trees, then rising ground to the first hills, and many miles distant the soaring white peaks of the Andes proper. 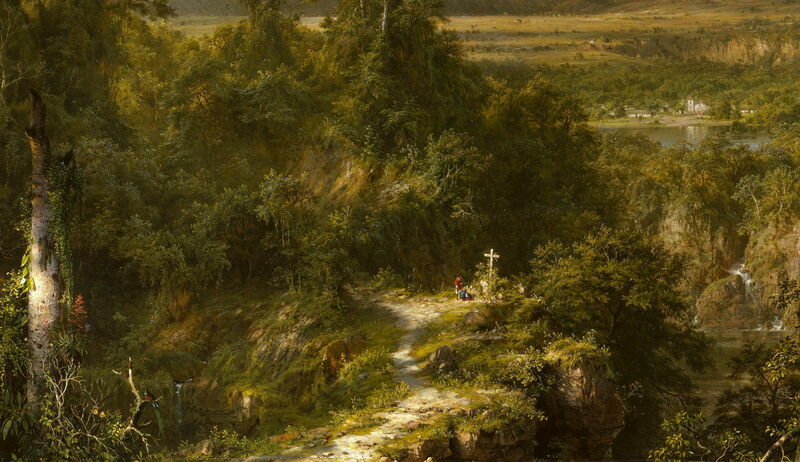 Frederic Edwin Church (1826–1900), Cross in the Wilderness (1857), oil on canvas, 41.3 × 61.5 cm, Museo Thyssen-Bornemisza, Madrid. Wikimedia Commons. This was not the first time that Church had painted a crucifix in a landscape. In 1857, his Cross in the Wilderness featured a more prominent cross, here decorated with two garlands of flowers. But this wilderness is unpopulated, devoid of figures or other signs of human presence. Many of Church’s other finished paintings contain figures, and The Heart of the Andes is by no means unusual among them. 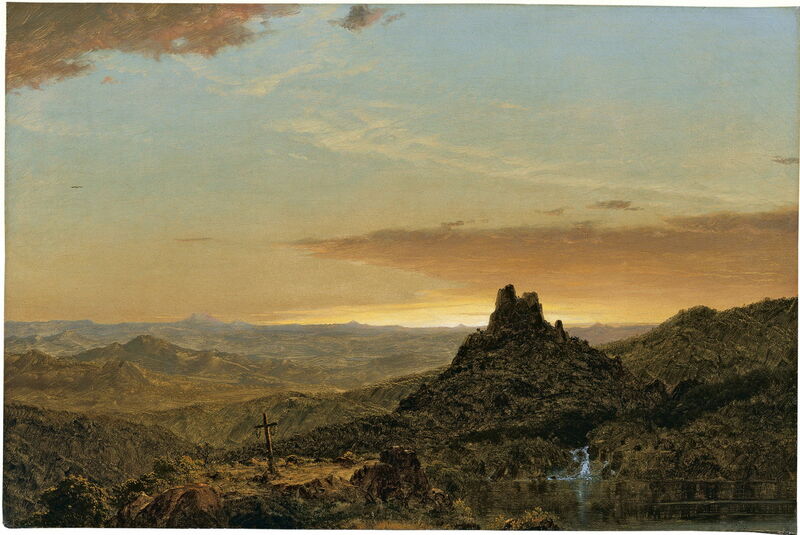 Frederic Edwin Church (1826–1900), West Rock, New Haven (1849), oil on canvas, 68.9 × 101.9 cm, New Britain Museum of American Art, New Britain, CT. Wikimedia Commons. 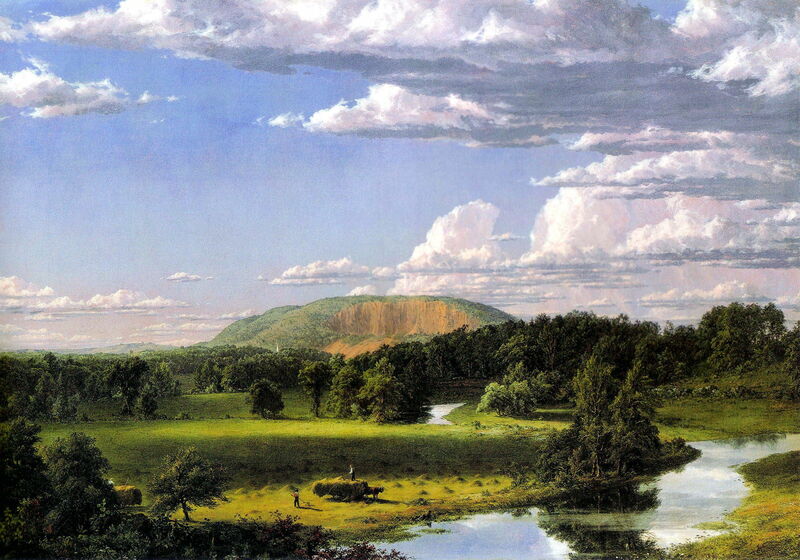 Church’s early landscape painting of West Rock, New Haven (1849) is a good example. As shown in the detail below, its foreground features three figures making hay, which they are stacking onto carts drawn by oxen. Down at the river bank, a dog is enjoying a paddle. Just peeking proud of the distant treetops is the white tip of a church spire. 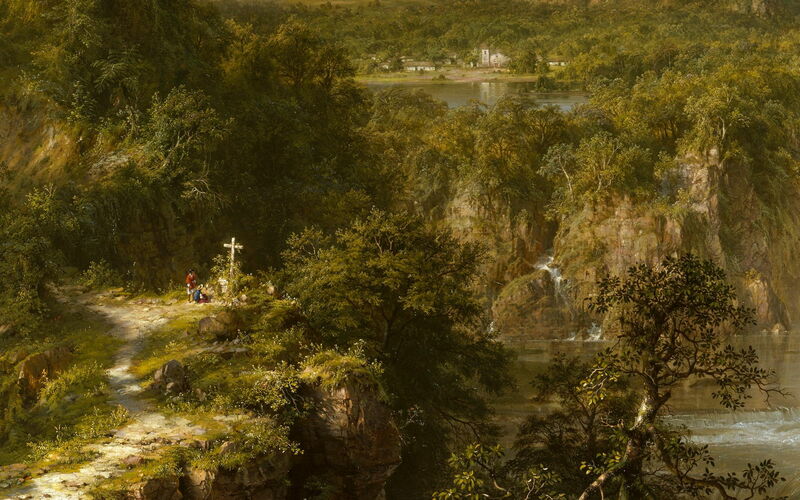 Frederic Edwin Church (1826–1900), West Rock, New Haven (detail) (1849), oil on canvas, 68.9 × 101.9 cm, New Britain Museum of American Art, New Britain, CT. Wikimedia Commons. 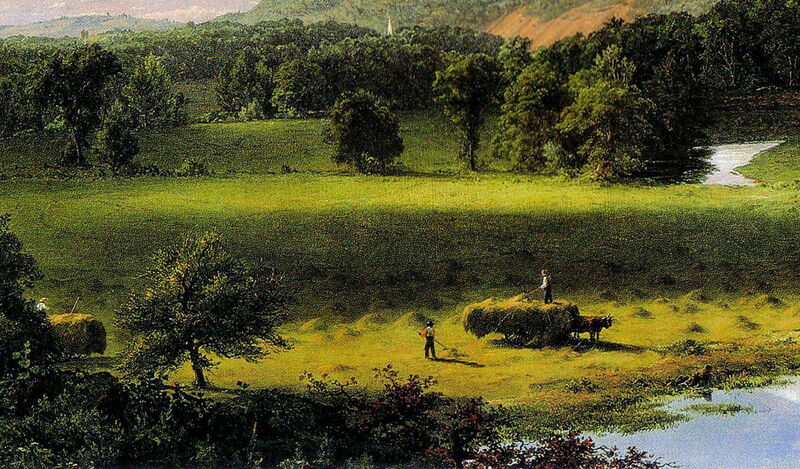 Two people are making their way along the path to the ranch in the foreground of Church’s Cotopaxi (1855). 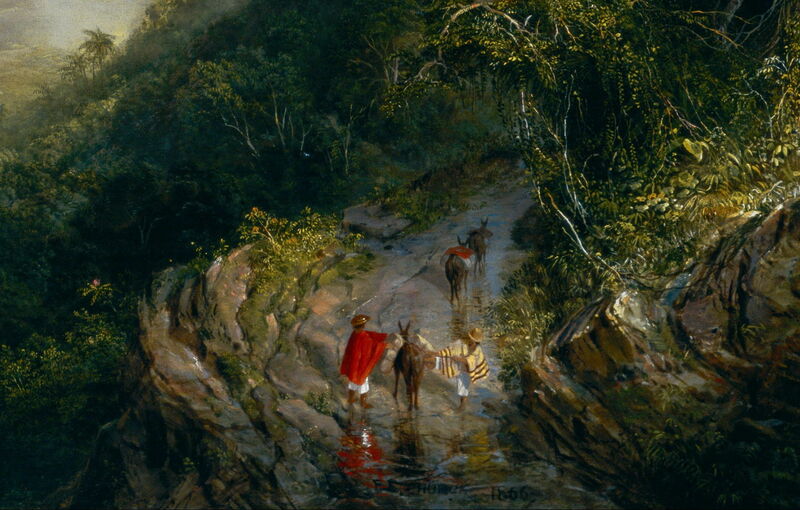 One is mounted, the other almost hidden by the laden mule they are leading, and a dog follows behind. Again, they appear to be the only humans visible in this grand view. Church’s paintings after The Heart of the Andes continued to include figures too. Beneath the spectacular double rainbow of Rainy Season in the Tropics (1866), they add a dash of contrasting colour. As shown in the detail below, there’s even more on the move in this painting. Splashing through a rocky stream is a small train of pack animals with two drivers, who have paused for a moment to adjust a load. Frederic Edwin Church (1826–1900), Rainy Season in the Tropics (detail) (1866), oil on canvas, 142.9 x 214 cm, Fine Arts Museums of San Francisco, San Francisco, CA. Wikimedia Commons. 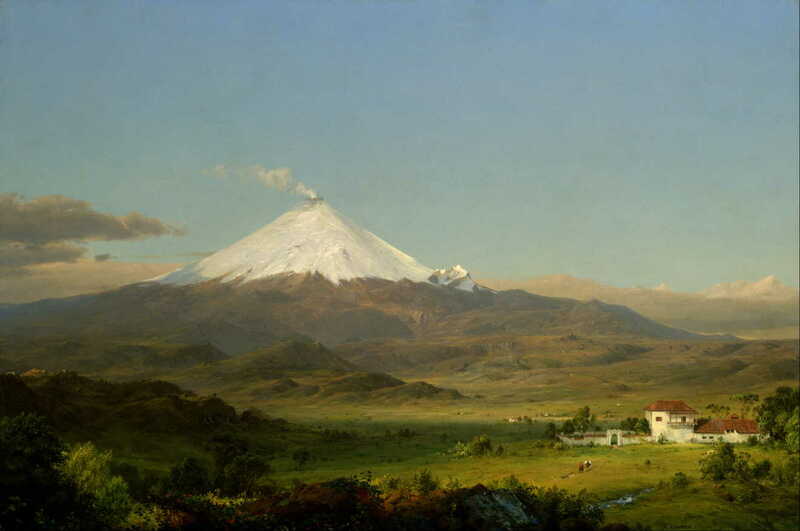 Frederic Edwin Church (1826–1900), Pichincha (1867), oil on canvas, 78.8 x 122.5 cm,, Philadelphia Museum of Art, Philadelphia, PA. Wikimedia Commons. Spanning much of the foreground of Church’s Pichincha (1867) is a suspended bridge, one end glowing in the early morning light. 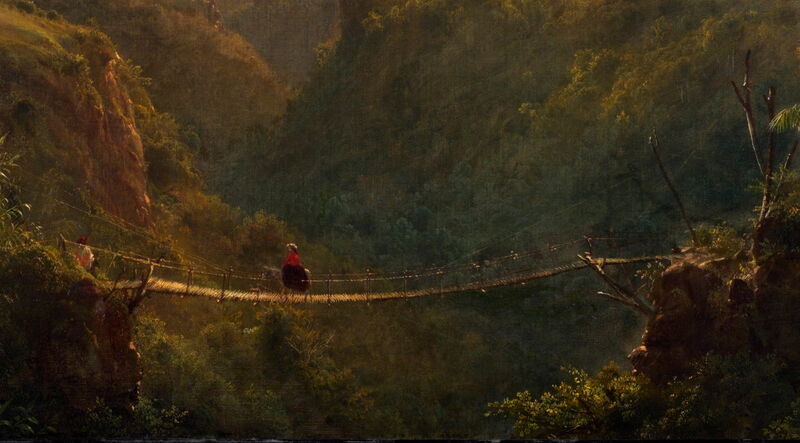 Just over half way across, a woman wearing a brilliant red blouse is riding side-saddle on a mule, which is picking its way slowly across the thin logs which form the walkway of the bridge. At the left end is another mounted figure, who has just completed that frightening crossing. 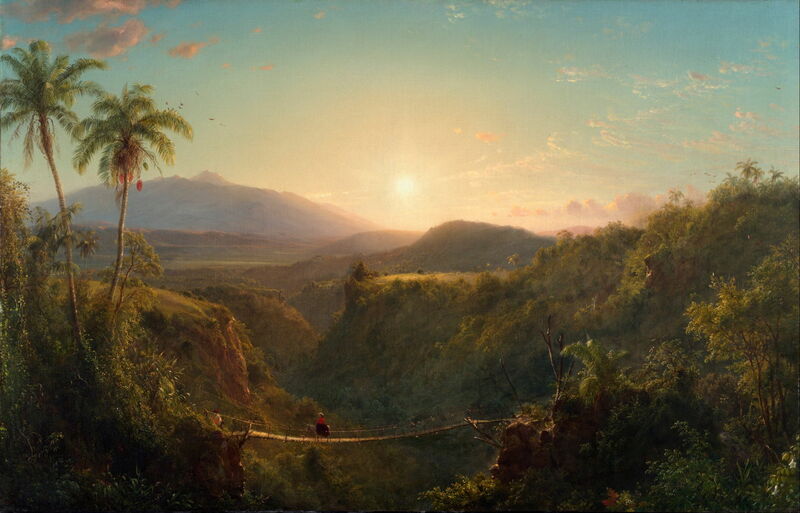 Frederic Edwin Church (1826–1900), Pichincha (detail) (1867), oil on canvas, 78.8 x 122.5 cm,, Philadelphia Museum of Art, Philadelphia, PA. Wikimedia Commons. 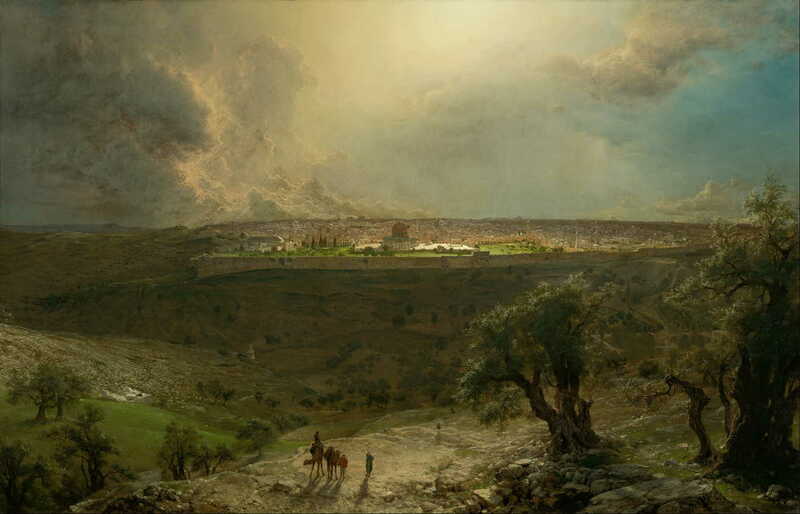 In Church’s late view of Jerusalem from the Mount of Olives (1870), the Holy City is reminiscent of John Brett’s Florence from Bellosguardo (1863) in its projection and detail. But Church’s lower vantage point allowed him ample foreground, in which there are four people and two camels making their way along the dry, stony track which skirts the ancient olive trees and crosses the valley to the city. Although not as brightly lit by the late afternoon sun as the Dome of the Rock in the distance, Church draws attention to the figures in the foreground by silhouetting them against the light on the track. Then how should we read the two figures and the cross in Church’s The Heart of the Andes? Is there some concealed story, or hidden meaning to them? If all the indications are that the artist often placed figures as staffage in the foreground of his landscapes, why should they be any different? One big, indeed very big, difference is the size of that painting, and the manner in which it was intended to be viewed. When advertised to the public, viewers were requested to bring ‘opera glasses’ (binoculars). In its frame and surround, the whole stood more than three metres (twelve feet) high. From dawn to dusk, its exhibition room was seething with people. The world had changed a great deal since Thomas Fearnley’s more intimate landscapes in the first half of the nineteenth century. Those who paid their twenty-five cents to see Church’s great glory as it toured the cities of America were more affluent and more used to optical devices. Although photography was still quite novel, and hardly everyday, optical instruments were far more widely available. Viewers were now more used to getting ‘close up’ with their aid. For them, looking at Church’s painting was no different. With opera glasses held to their eyes, they’d expect to see such intricate details. But with the milling crowds, there would be no chance to get up and close to the painting. In any case, because of its height, few would be able to see much detail without optical aids. A little subtle staffage in the foreground – colourful birds, a couple of people, and all those visibly different plants and trees – was perfect. It made bringing the opera glasses worthwhile. Raab, Jennifer (2015) Frederic Church, The Art and Science of Detail, Yale UP. ISBN 978 0 300 20837 5. Posted in General, Painting and tagged Church, Fearnley, figures, landscape, painting, staffage. Bookmark the permalink. Thanks so much for these magnificent posts. I enjoy the thoughtful commentary and exposure to artwork that I otherwise would not be likely to encounter, at least not on a routine basis. I’d visit your site almost daily just for the Mac posts, but the art discussion has made this place something special. Thanks again! Thank you for your very kind words. It is my pleasure too!